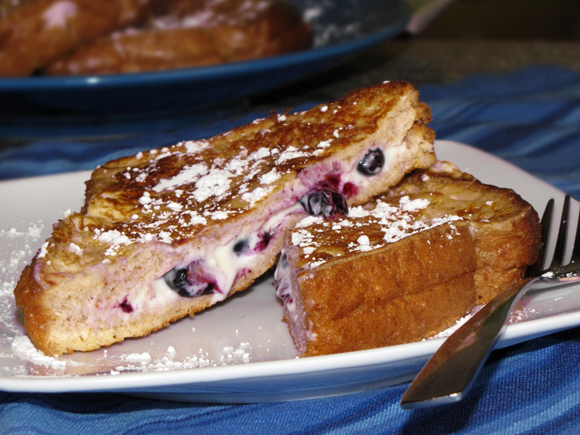 I always thought stuffed french toast would be hard to make so I never really attempted it. Well, the other morning, I thought I'd give it a go. Normally the toast comes from a thick slice of bread with a slit cut through the middle. I didn't have thick bread but I've never actually had stuffed french toast and I since had my heart set on it so I just knew I had to improvise. We almost always have regular wheat bread on hand so I figured I'd 'create' the thickness by using two pieces of that as a replacement for the one thick piece. And you know what? Two slices of regular bread was the perfect size. I put them together to see if I could get the same result and I did! I spread one slice with a little cream cheese and sprinkled some blueberries on top. I then put the other piece on top and smooshed them together a little to make sure they didn't fall apart during the cooking process. After a dip it in an egg and milk mixture I cooked it up like regular french toast and I had a perfectly gooey, perfectly tasty piece of stuffed toast. It was really easy to make, too, so I think I might try some variations of this concept by using different ingredients. Peanut butter and jelly stuffed french toast, anyone? 1. Whisk first four ingredients together in a short, wide bowl. 2. Mix cream cheese and sugar together and spread on 4 slices of bread. 3. Top the cream cheese with blueberries. 4. Place a slice of bread on top of each piece and press the two pieces of bread together slightly. 5. Melt a little butter in a large skillet or lightly spray a griddle with non-stick cooking spray. 6. Dip each bread combo into the egg mixture and make sure it's coated well. 7. Cook them for about 5 minutes each side, over medium heat, until browned. Basic staple of my childhood was a fried peanut butter and jelly sammy. My dad would make it just like a grilled cheese, just pb&j instead of cheese. This sounds like an interesting way to try it next time I make it for mine. Ever try making a monte cristo the way they did at Bennigans? It was some kind of triple layer sammy dipped in a like...a pastry ish flaky batter I guess? Served with raspberry preserves. Benn years, only had it once, but it was AWESOME. Grilled peanut butter and jelly sounds pretty good. My son and husband would probably love it!